It’s truly an honor to receive this award from SME in recognition of my 45-year career to make manufacturing an advanced, high-tech engineering profession. 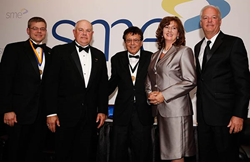 SME, a key resource for the manufacturing industry, recently recognized Yoram Koren (http://www.sme.org/honorary-members/#koren), DSc, HSME, professor emeritus of engineering at the University of Michigan, as its 2015 Honorary Member. Koren received his award at SME’s International Honor Award & Scholarship Presentations Ceremony June 1 in Detroit. This prestigious award is reserved for individuals whose overall contributions to manufacturing align with SME’s efforts to promote the importance of manufacturing and attract future generations to the industry. Koren was chosen for his leadership, innovation and implementation of manufacturing technologies, particularly related to automation and reconfigurable manufacturing systems. Through Koren’s graduate courses, he has also impacted a generation of practicing engineers, and provided the knowledge and skill sets required for a new generation of manufacturing technologists. To date, more than 60 manufacturing leaders have received this award. Previous recipients include Heartland Robotics’ Rodney Brooks, PhD, HSME; Northrop Grumman Corp.’s Ronald Sugar, PhD, HSME; and the Japan Science and Technology Agency’s Professor Hiroyuki Yoshikawa, HSME. Nominations for SME Honorary Member candidates can be submitted to the SME president for review. The SME Board of Directors will then choose the winner through a two-thirds majority vote. Once chosen, SME Honorary Members receive dues-free SME membership and can use the designation “HSME” after their names, signifying “Honorary Member of SME.” To review additional award information and previous recipients, visit sme.org/honorary-members.